Jamal Aliyev isundoubtedly one of the mostbrilliantcellists of the young generation. Azerbaijani cellist has quickly amazed the world with his extraordinarytalent and charisma. Becoming a musician was genetically pre-ordained for Jamal - both of his parents are involved in music. Aliyev`s grandfather played a large role in developinghis musicalskills. Future cellist began his musical studies with his first teacher and beloved grandfather, Honored Artist of Azerbaijan Kara Aliyev. Hetrained dozens of supremely gifted musicians, laureates of various international competitions. Speaking about his family, Jamal Aliyev also mentioned his great-grandfather and his brother. "His brother, Azad Aliyev is aviolinist, People's Artist of Azerbaijan. Recently, the first international violin competition named after him was held in Baku. And great-grandfather - Hamza Aliyev is one of the founders oftar school in Azerbaijan, Shusha musical school. A street in Shusha and a school in Ganja are named after him. Among his students are such famous musicians as Suleyman Alasgarov, Khambar Huseynli and Fikrat Amirov," he said. Jamal Aliyev displayed musical talent at a youngage, already playing the concertsat the ageof 5. He won the prize at Trakya International competitionat the age of 9 as well as Antonio JanigroInternational CelloCompetitionwhen he was only 11 years old. Young cellist was invited to study at Moscow Conservatory Central Music School and Yehudi MenuhinSchool in London. When Jamal turned 14, he decided to choose London. After that Jamal Aliyev and Sir Karl Jenkinson began to perform much time together. Sir Karl Jenkinson has recently composed a music piece for him. Jamal Aliyev will present the work of famous English composer at Royal Albert Hall on April 23. 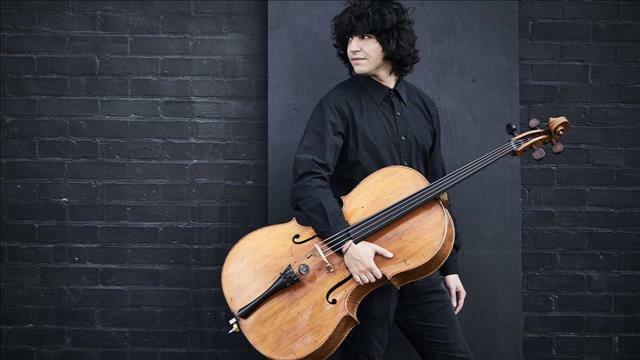 Azerbaijani cellist will appearonthe world'smost famousstage for the second time. In the interview,Jamal Aliyev shared his feelings and thoughts on the most memorable performance in his life. "The most memorable performance in my life took place at Royal Albert Hall, where the anniversary concert of the world famous Hollywood composer John Williams was held. He chose all the performers himself," he said. John Williams invitedJamal Aliyev to perform at the concert hall in front of 7,000 spectators. This memorable event madean unforgettable impression on the cellist. Speaking about one of his recent achievements,he noted the prize of The Musicians` Company(2017)ofwhichhe isa member. "I also won the award of the very famous Turkish pianist Fazil Say. He is my idol. And now I came to Istanbul for a rehearsal with him," Aliyev said. By the way, Jamal Aliyev and Fazil Say will give two joint concerts in Turkey. The musicians will perform in Eskisehir (March 13) and Istanbul (March 15). The member of UK Delegationto theParliamentary Assemblyof theCouncilofEurope, Baroness Emma Nicholson is a frequent guest at the concerts of young cellist. Baroness Emma Nicholson also invited Jamal to Westminster Abbey as she could not visit one of his concerts. Jamal Aliyev said he was very pleased to accept the invitation.